Now that I'm seaming and finishing up Juno, I've been trying to pick my next cardigan project. I did some stash diving and I have three possiblities, so I thought I'd let you guys choose since you're going to be the ones who read about it anyway. So, take a look, check out the yarns and the patterns (I'll try to give both Ravelry links and non - Ravelry links for each pattern - for those of you not on Ravelry), and leave a comment in the comments section (really the best place for comments when you get right down to it). Whichever potential project gets the most comments will be cast on next! This yarn is something I handspun from three different batches of fiber that were similar colorwise. I finished it at the end of 2007 or so. 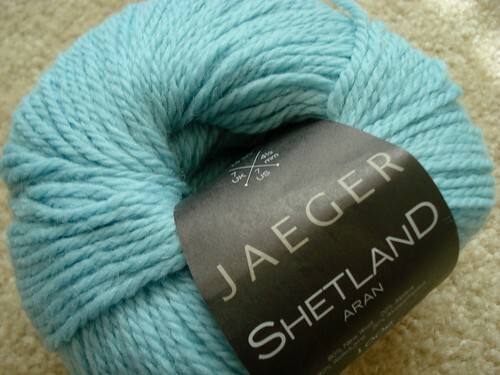 The yarn is not solid, but shades between lighter and darker tones of the pale blue green and is a 3 ply. I may or may not put the buttons where they are in the pattern. If I change the button placement, I'll put them lower, right about bust level. This is also hand spun yarn from a merino color blend made by Ohio Valley Natural Fibers. I spun this right after I finished the Mojito Love fiber, so it was finished in early 2008. It's a 3 ply, heathered yarn. I would make the version with the 3/4 length sleeves. This yarn is a non-released color of a discontinued yarn so I've been hoarding it for ages. 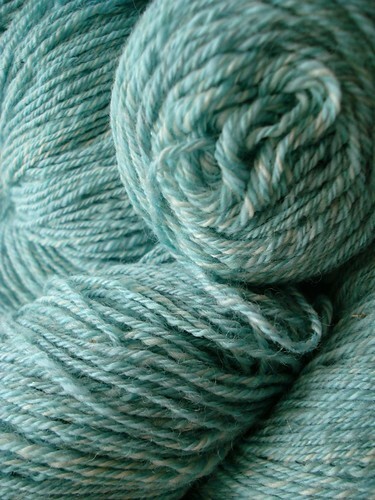 It's a gorgeous Robin's Egg blue (a little more blue than Mojito Love) and it is a solid yarn. The Cassidy design is the type of thing that's a classic in my wardrobe and I do need a hoodie in this color. The solid will make the cables pop and texture should show up well. So, take a look at the yarns, take a look at the patterns and leave a comment! Oh, definitely the CeCe - very versatile, looks like it would be quite quick to knit, and I love the raspberry yarn you spun! I love all your choices, but have to say,I'm partial to Cassidy. She was one of the most fun knits I've done. It is a beautiful sweater. I did mine as a gift but intend to make one for myself sooner rather than later. My vote is for Cassidy (which I have made 2 of so far) because it is a fun design to knit yet not boring, the color would let the cables show up nicely, and it's a design that will go with everything. Plus it will keep you warm on those cool days and you'll get lots of compliments when you wear it! I vote for Cece. 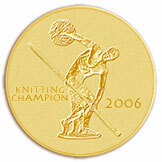 I think it would be a very practical knit for your part of the country, and the color of the yarn is gorgeous. I vote for the CeCe. I think it will look great in that lovely color, and it's a versatile sweater. I really like Coraline. Of course if it were really me, I'd start all three...but that's just how I am. Don't comment often but love your blog. I vote for #3 but my second choice is #1. Cassidy. Perfect for Texas winter weather. I'm breaking my habit of lurking to say that I really enjoy your blog, I admire your talent and your sense of humor. As for what to cast on next, I can't decide between CeCe and Cassidy.....I know that is completely NOT helpful. I suppose it depends on whether you want something more dressy or more casual? You seem to have gotten a lot of us lurkers to comment with this one! I vote for Cassidy; perfect combo of yarn & pattern. I vote for Cassidy, but with a slight shaping change. Maybe more pulled in at the waist and slightly flared for the hip? I'd vote for the CeCe. I made one for myself in a cotton silk blend and love it for spring. I'm voting from two perspectives! From my perspective, I'd knit Cassidy because I live in a cooler climate and am a cably person, not a lacy person. HOWEVER, *you* live in TX and CeCe would be much more useful. Whichever you knit first, I'm hoping you'll knit the other two after! LOL Give the beasts pats and skritches for me, please. It looks like Cassidy is in the lead, so I may have to leave multiple comments to get CeCe back on top. Of course, I have an ulterior motive -- I'm getting ready to knit CeCe and will be interested in reading your comments, not to mention seeing your usual mods. Definitely the Coraline, for the yarn, which is gorgeous. As I am totally unable to spin anything, I am totally jealous of you because of this beautiful yarn. That is why I must see more of it, and the only way is that you knit something with it, sos go for the Coraline, which is an adorable pattern, by the way. Oh, what a great idea to let all of us comment. I vote for Coraline - I would love to see your take on that with this lovely yarn. I vote for Cassidy because it's winter, and winter is the time for aran patterns and hoods! It's the one I would most enjoy right now, anyhow. But you can't go wrong with any of these! CeCe for your TX weather. I love the Cassidy, though. Personally, not a fan of the shape of Coraline (which I know is quite popular). On you, it will probably look great, but I have too much tummy for that look. I will stay tuned, either way -- love to see your work. It's nice to see you considering a couple of Chic Knits patterns, as I'm about to cast on one myself, but I think I would vote for Coraline in that yarn. I'd love to see it in handspun! My vote is for the Coraline. I think it would look good in the Ice Blue Mist. Personally I think Cece would be great for TX! I love the yarn color too! Next choice would be Cassidy. Can't wait to see what you choose to cast on! My vote is for Cassidy - it's in my queue as well. And yarn that's stashed too long has a tendency to pout. I vote for Coraline, but I'm a guy, so what do I know? I'm in love with the cassidy cardi! I have an obsession with cables and those are fantastic! the blue would be so soft and comfy too! I vote for Coraline. My second choice is Cassidy. I vote for Cassidy. That yarn should really sing in Cassidy. Cece - not so much. That's a spring sweater, and I am underwhelmed at the fit. How can one choose? I say all three, starting with #3, Cassidy. It's a good project for the short winter in Dallas. 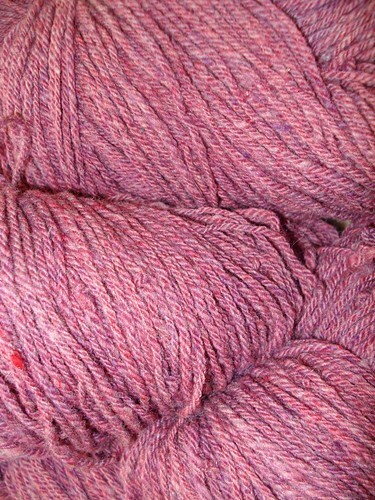 Then Coraline, to finish the chilly weather knitting, finishing with CeCe, which will be ideal for the warmer weather. All three sweaters and yarns will be beautiful on you. I like Cassidy first and Coraline second! I say Coraline first and then Cassidy - I love the blue handspun yarn you made . My vote is for Cassidy, I like both the color and the interesting cable work. My vote is for Cassidy. Love it! My choice would be Cassidy, followed by the design from Ysolada Teague.